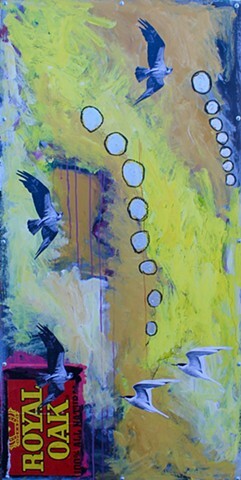 This original painting measures 24" x 48". It is on board mounted to gray primed stretcher bars with screws. In addition to painting and collaged elements, I also used drawing materials, namely pencil and oil pastel. Titled 'The Hope of Insight (Royal Oak)', it marks an attempt to bring together my efforts in collage and my experiments in abstract painting.